Rice is one of the most common side dishes. It is ideal for preparing porridges, puddings, salads, casseroles and pilaf. This cereal is rich in vitamins and minerals, and is absorbed by the human body. 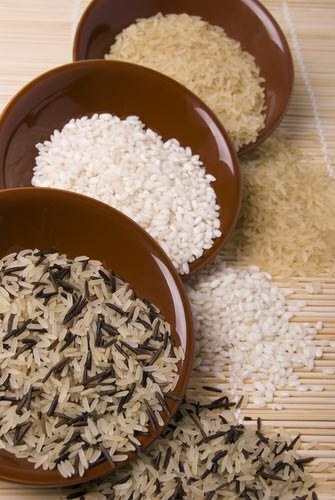 To deal with all the intricacies of cooking rice is not as easy as it seems at first glance. So many do not know how to cook, to transform not just edible weight, and a real masterpiece of cooking. Take a pic (for cooking it is better to use basmati, this variety has long, sharp, fine grain, and it turns out more fragrant, more beautiful and tastier than others). Place it in a sieve and rinse in cold running water for 1-2 minutes. In a pan pour a small amount of vegetable oil and add the rice. Stir it with a wooden spatula until the moment when all the seeds are not covered with oil. Due to this rice will turn out crumbly. Boil water in a kettle and pour the required quantity into a measuring Cup. Remember: liquids must be in 2 times more than rice. For example, to 150 ml of rice you will need 300 ml of water. Then pour the boiling water into the pan. Next, add salt, about 1 teaspoon for every 150 ml. Once you added hot water, stir the rice. This should be done only once, because with more frequent stirring may break the delicate grains. Then they will stand out the starch, and your side dish will turn out sticky. Cover skillet and reduce heat to low. Cook brown rice about 45 minutes, and the white about 20, without lifting the lid. If you open it and release the steam, the rice will cook much more slowly. And cook it must as soon as possible. Check the readiness of the rice, tasted the seed on the tooth. Also find out if your side dish, you can gently tilting the pan. If one side is going liquid to cook the rice should be a few more minutes. When the rice is ready, turn off the heat and remove the lid from the pan. Then put a clean kitchen towel for 10-15 minutes. It will absorb all excess moisture, and your side dish will remain crumbly and dry. Before serving loosen the rice with a fork or a stick. Most useful unpolished rice. Since many vitamins and amino acids concentrated in the shell of the grains. Always measure rice by volume using a measuring jug. Measure 65 ml per 1 serving (130 ml for 2 servings, 260 ml for four and so on). For boiling rice is very good frying pan with a larger diameter. After all, the thinner the layer of rice, the better it is prepared.